After the ridiculous Tribal Council, Sarah confronts Cirie about her trying to steal her advantage and eventually Tai admits that he in fact did try to target Sarah. Cirie spoke the truth! Since this finale is kicking off with six people, it's pretty rapid fire. Brad wins the maze/puzzle Immunity Challenge as well as a reward, where he indulges in chicken parm and game talk with Troyzan and Sarah. The three decide to target Aubry who is a bigger challenge threat, but Brad reveals he's going to force Tai to play and idol at this vote. 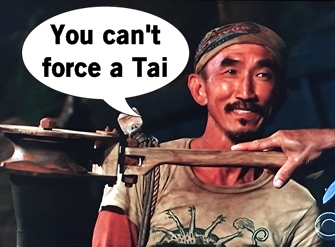 Not just that, after Tai's confession to Brad that he has two idols, Brad demands Tai give him one of the idols so he pull any funny business at Tribal Council, but in an intense and controlling way. Tai doesn't appreciate being bossed around and treated like garbage, so he decides to regain control; he tells Aubry about his idol, and ponders joinging with Aubry and Cirie (except he doesn't trust Cirie). Everyone begins to worry about Tai since word gets out he's packin' two idols. Tribal Council time! Probst asks about the crazy previous Tribal Council and Tai feels everyone lies, but he took all the blame. Sarah explains Tai is taking the heat because he doesn't take accountability. Most think Tai can't recover from this error, which Brad says "buyer beware" if you try to work with him. 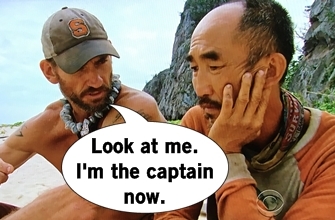 The group votes and Probst brings back the urn and Tai makes his big move: he plays one idol on himself, and then one on Aubry. They're immune. THEN, Sarah busts out her Legacy Advantage which could only be played when there were 13 or 6 players in the game. She's immune. Troyzan hopes on the #ImmunityTrain and plays his Hidden Immunity Idol. He's immune. Brad has Individual Immunity. This means that Cirie is the only player without immunity and therefore automatically eliminated, despite not a single vote in that jug being for her. 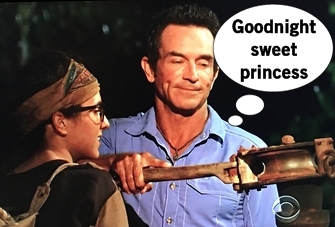 Probst gives the Survivor icon a salute on the way out, allowing her to give a speech about this game being a life changer for her. Oh Cirie, you shall be missed! The final five try to maneuver balls on paddles through obstacles and Brad completely slaughters the challenge to win Immunity again. Aubry sees the writing on the wall but doesn't give up, trying to flip the game. Brad and Troyzan are a tight twosome which means they can't bring both Sarah and Tai to the end; one of them is gonna get axed. Aubry encourages them to increase their odds of getting to the final three and vote off Troyzan. Sarah and Tai ponder this offer, agree to vote off Aubry, then Tai reconsiders because Brad's bossing him around again. Come Tribal Council, Aubry is all smiles knowing her fate is probably sealed. Everyone is living day-by-day to get to day 39. Aubry reiterates that Brad and Troyzan will be taking up final 3 spots if either of them wins the next immunity. Sarah points out that who to keep and send to the jury is different for each person and they'll all be keeping that in mind when voting. Troyzan is sure he can beat everyone, while others have a bit more modesty. And so it is with a heavy heart that I have to report that Aubry is voted out. Once again, I'm so amazed and proud of my friend - a true Game Changer. 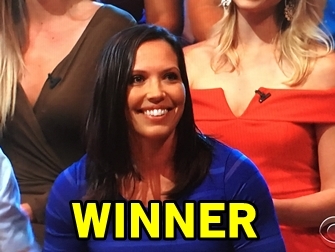 Aubry's prophecy is correct and Brad wins Immunity one last time (joining the Survivor Immunity Five Timers Club), meaning him and Troyzan are cruising together to the final three. But will Sarah or Tai join them? Oh, hands down it's Sarah as Brad wants to knock out the person who has betrayed him the most. Tai knows he's screwed over Brad so many times that he's doomed, so he suggests Sarah to force a tie and head to a fire battle against Troyzan. Sarah considers the benefits of who is better to take to the final Tribal Council. At Tribal Council, Brad rolls up dressed in a burlap sack like he's Dobby the house elf but with the aggressive attitude of a Malfoy. Sarah and Tai are on the chopping block, but Tai still hopes a tie could happen. 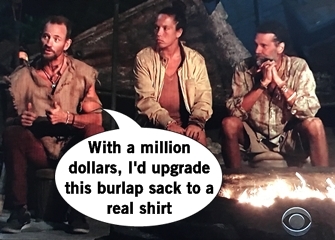 The possibility of a tie surprises Troyzan but hey, it's Game Changers! Ultimately, there's no tie and no more Tai, as he's voted off in a 3-1 vote. We're live! It's the reunion show and by a 7-3 vote, Sarah is named the Sole Survivor. Sarah says she was inspired by Tony's game to switch up the way she played before to instead win this time. Plus she got permission from family, work, etc to play balls to the wall, though she doesn't love that she had to betray so many people. Probst is obsessed with the idea that Brad made the wrong choice choosing Sarah over Tai (who he apologizes to). Turns out it maybe would've been a tie and then we'd have to go to the first ever tiebreaker. The big reveal: in the case of a Final Tribal Council tie, the finalist not a part of the tie joins the jury and casts the vote to win. While it's interesting to know this fact, I'm a little bummed it was revealed in a moment like this rather than making it a future epic TV moment should it happen. 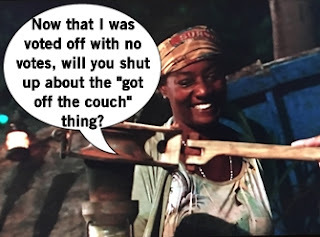 After this, Probst does rapid fire check-in questions with people, with Cirie encouraging people to "get off the couch" which has become her irritating catchphrase. There's a focus on Zeke's outing and the positive conversation it generated in the fan community. Sandra will do what it takes to win, Cochran is just the universal Survivor crush, and Sierra followed her heart to reveal her advantage to Sarah which was her worst move. And the jury liked the new format! Next season is revealed to be Heroes vs. Healers vs. Hustlers, which we'll need to call Triple H because it's a mouthful. See you in the fall for another season! 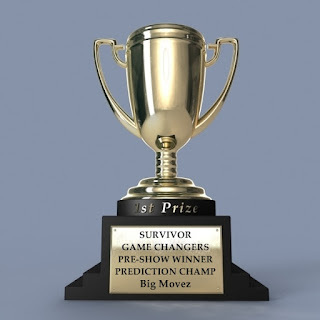 One last piece of business: Pre-Show Winner Prediction trophies! Congratulations to the following for their correct pick of Sarah to win the whole thing.